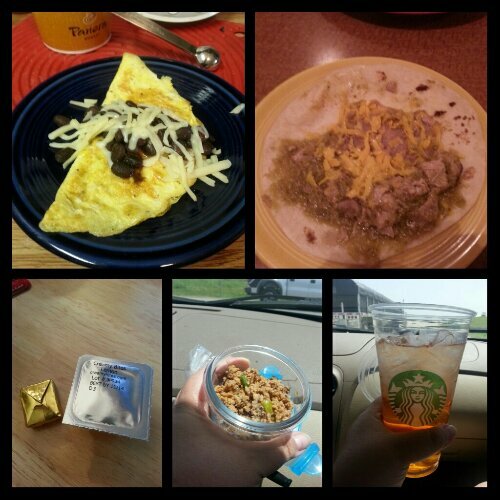 One-egg omelet with Jack cheese and a tablespoon of black beans; a pork in green chile sauce with refried beans and cheddar cheese (I just ate it off of the tortilla); an Isopure Zero Carb in a Starbucks cup; Genghis grill lettuce wrap filling; multivitamin and calcium supplements x2. I’m on the road this weekend so eating away from home has been a bit challenging. I did pack a cooler with snacks and protein drinks for the ride down, and have made sure that I scope out the menus of potential places we dine to see if there are sleeve friendly options available. I am also without my food scale so eyeballing portions has also been a challenge. I did learn today though, that the meat filling of a taco is the perfect amount of food. I also contend that a great haircut will boost your fabulosity tremendously. Because I’m writing from my phone, this is going to be brief so I’ll sign off for now. This entry was posted in challenges, daily bites, post-op, vsg, weight loss surgery and tagged challenges, choices, daily bites, life must go on, VSG, vsg realness. Bookmark the permalink.